Les, or Ez Folatières is Puligny's largest first growth, at 17.65 hectares. It lies on the same altitude as Les Caillerets, Chevalier-Montrachet and Le Montrachet itself, but to the north, between 250 and 300 metres above sea level. It includes the lieux-dits of En La Richarde, a recent addition, Peux Bois and Au Chaniot, all of which are at the southern end. While many would argue that Caillerets is possibly the best of the Puligny premiers crus, Folatières is certainly among the very best. Those further upslope - Le Garenne, La Truffière, Les Champs Gain and others - are lighter and less fine, and in lesser years can be a bit thin. Clavoillon, below, produces a more four square wine. Only Clos de la Garenne, next to Folatières, Perrières, Combettes and Champ Canet, further north towards Meursault, plus Pucelles, which marches with Bienvenues-Bâtard-Montrachet, can match the elegance of Folatières, and only in Clos de la Garenne (owned by the Duc de Magenta and exclusive to Maison Jadot) will you find a wine with the same depth of character. As you would expect in Burgundy, though essentailly limestone, the geology is complex. The lower and eastern part of the Folatières climat is made up of a compact, hard, erosion-resistant lower Bathonian rock, found and quarried a couple of kilometres away in Chassagne-Montrachet. The surface soil is rich in stones and rather thin. The uppermost part consists of compact limestones and dolomites equivalent to the Comblanchien rocks of the Côte de Nuits, and also found in the rocky outcrop between Genevrières and Narvaux in Meursault. The soils are once again thin, and rich in stones. Between the two lies a thin strip of marl abundant in large mussel-like fossils. Erosion is more commonplace here, so rendering the shalier soils found here more concave. Downslope there is a distinct fault, below which the limestone resembles that of the hill of Corton. You can see the fault in the upper part of Le Montrachet. (My thanks to Francoise Vannier-Petit, local geologist for this information). But, while this geology is instructive, what effect does this have on the wine? Eric Rémy, regisseur of the Domaine Leflaive, says that in the southern part of the climat there is a littlemore clay: hence powerful, but elegant wines with good fruit; while the more stony northern section makes more mineral wines. Franck Grux of Olivier Leflaive Frères points out that up-slope the surface soil is very thin. It can get very hot and dry; and the fruit can rapidly degenerate into super-ripeness, producing wine which is heavy and superficial on the follow through: too primeur for comfort. I incline to the view that the best sector is that on the same latitudinal line as the Caillerets, rather than further up-slope. Here are the most complete Folatières. Those who have vines here, in rough south to north order, include Philippe Chavy, the Château de Puligny, Domaine des Lambrays, Jean Chartron, Réne Monnier, Paul Pernot (in part), Vincent Girardin and Sylvain Bzikot. Folatières is a full wine, meaty, mineral and with plenty of weight of fruit and good grip. It ages well. The best, in the best vintages, require seven or eight years to mature. I asked the growers in the early months of 2010 whether they would be interested in participating in a comparitive tasting, and I chose 2006, one of the best of the recent vintages, though perhaps one which is more vintage- than terroir-representative. They responded enthusiastically, though some did not have a single bottle to spare for the tasting. The tasting was held at Hotel/Restaurant Le Montrachet in Puligny itself. My thanks to André Berthier, chef sommelier, and his colleagues for setting up the tasting. 43 ares. Bottled after 18 months. 30 percent new oak. Slightly heavy nose, with a touch of sulphur and at the same time some evolution. Better on the palate. Much cleaner. Fullish body. Very good grip. Plenty of depth. Properly dry. Quite a meaty wine. Long and satisfying. Very good indeed. 16 ares. 18 months. 30 percent new oak. Clean, crisp, racy, high class nose. Subtle and flowery. Medium-full body. Ripe, complex, lovely fruit. Very well-balanced. Lots of depth and distinction. Very fine. Just about ready. 20 ares. 11 months. 20 percent new oak. Delicate nose. There doesn't seem to be a lot of depth here. On the palate medium to medium-full body. Clean and enjoyable. But not really the concentration and dimension of a top premier cru. Balanced but a bit slight. Good at best. 40 ares. 15 to 18 months. 40 percent new oak. Ripe nose, a touch exotic. Fullish, open, balanced and just about à point. Good grip. Plump. Quite rich. An attractive wine which is long on the palate and just about ready. Very good indeed. 17 ares. 12 months in cask, followed by 12 months en cuve. 100 percent one year old casks. Quite evolved and a little tropical on the nose. Full and rich, but does it lack a little grip? Better on the palate. Fullish, abundant, decent acidity. Not too exotic, but it could have done with a little more finesse. Balanced and quite concentrated nevertheless. Good plus. 45 ares. 12 months in cask and then three in vat. 30 percent new oak. Attractive, cool and minerally on the nose, but a little light-weight. Medium to medium-full body. Good attack, ripe and racy with a touch of new oak. Lacks a little energy on the follow through but by no means short. Very good indeed. 52 ares. 12 months plus 3 months en cuve. 15 percent 600 litre new oak casks. Firm, quite closed nose. But good depth and grip underneath. Lots of class too. Full body, backward, meaty and profound. Very good grip. It is just a little four-square at present but it needs time. Fine. 1.35 ares. 15-16 months. 25 percent new oak. A slight touch of sulphur on the nose. Better on the palate. Youthful. Medium-full body. Lots of energy and plenty of depth. Lovely balanced, classy fruit and very good grip. Fine. 60 ares. 12 months. 25 percent new oak. From magnum. Lovely rich, ripe nose. A touch more exotic than most. Lovely fruit. Medium-full body. Subtle, balanced, vigorous and very complex at the end. Very long and classy indeed. Fine plus. 1.03 hectares. 14 months. 30 percent new oak. Lovely subtle nose. Delicate, complex, classy fruit. Not a blockbuster. Indeed quite understated. Very harmonious, long and complex. Very fine. 30 ares. 11 months. 30 percent new oak. The nose is quite hidden. Fullish and a bit four-square on the palate. But a lot of depth and vigour. Still very young. Fullish, classy, very good grip. Got better and better in the glass. Very fine plus. Usual purchase not disclosed. 11 months. 30 percent new oak. Just a touch of sulphur on the nose. Ripe and rich and quite exotic on the palate. Fullish body. Not the greatest of class but good energy. Good plus. 27 ares. 12 months. 20 percent new oak. Classy if not very concentrated on the nose. Fullish, clean, racy and energetic on the palate. Finishes better than it starts. No lack of depth or finesse. Very good indeed. 1.40 hectares. 18 months. 20 percent new oak. Very lovely nose. Lots of class. Subtle and complex. Balanced and definitive. Medium-full body. Ripe, multi-dimensional, especially at the end. Very lovely. Very fine plus. 50 ares. 14 to 16 months. 20 percent new oak. Classy nose. Still closed. Fullish body. Balanced, and full of fruit. This is really very fine indeed. Multi-dimensional. 24 ares. 20 months. 20 percent new oak. Delicate nose. A little more marked by the oak than most. Medium-full body. Ripe, clean and well-balanced. Gently oaky on the palate but long and classy. Very fine. 29 ares. 12 to14 months. 50 percent new oak. Full, concentrated, very well-balanced nose. This is profound and youthful. Full bodied. Ripe, rich and vigorous. Lots of wine here. Lots of depth and lots of class. Very lovely finish. Needs time. Very fine indeed. Usually buy the equivalent of 10 pièces. 12 months. 50 percent new oak. Not a great deal on the nose. Medium-full body. Somewhat four-square. Not a lot of either class nor dimension; But decent grip and length. Good. 1.07 hectares. 12 months in cask, then 6 to 8 months in tank. 20 percent new oak. From magnum. Good balanced fruit on the nose. Fullish body. Ripe. Good grip. Good depth. Lots of energy and a long way from being ready for drinking. Lots of dimension and concentration. Very fine. Usually buy the equivalent of 8 to 10 pièces.15 to 18 months. 25 percent new oak. From magnum. Subtle nose. There is more here than seems at first. Classy and very harmonious. Lovely fruit. Fullish body. Ripe and complex and multi-dimensional. Very lovely, long, lingering finish. Very fine. 82 ares. 14 months. 30 percent new oak. From magnum. Complex, subtle nose. Still not fully evolved. But classy and promising. Beautifully balanced. Fullish body. Poised, energetic and very high class. Very fine indeed. 63 ares. 11 months. 25 percent new oak. Attractive peachy fruit on the nose. Good grip. Ample and very Puligny. Medium-full body. Succulent, pure, balanced and classy. Lovely finish. Fine plus. From 2012. 3.08 hectares. 11 months. 40 percent new oak. Not a lot of depth or class on the nose. A bit of sulphur too. I feel this is one of those 2006s that was picked a little late. It is a little concocted. Others liked it more than I did. Three voted it as one of their favorites. Usually buy the equivalent of 5 pièces.16 months. 40 percent new oak. Ripe, racy and classy on the nose. Profound and stylish. Lots of dimension. Full bodied. Youthful. Very good depth. A big wine with lots of energy. Needs time. Fine plus. 27 ares. Plus the equivalent of 9 pièces bought as négociant. 18 months. 25 percent new oak. Lovely fruit on the nose. Ripe, clean and harmonious. Nicely racy. Medium-full body. Balanced. Good grip. It just seems to tail off a bit at the end. Very good indeed but not fine. I took a consensus of the group's preferences. The four most favoured wines were those of Vincent Girardin, Domaine Leflaive, Olivier Leflaive and Remoissenet, the last two being merchant wines (but where such merchants were heavily involved in the local viticulture and were bought in as fruit.) The Lambrays sample, plus one or two others, were late arrivals and sampled seperately. Note that Chanson and Faiveley, who can today offer you Folatières, did not possess their parcels in 2006. En primeur, Puligny-Montrachet, Les Folatières, 2006, was offered at £240 to £275 per six bottles, ex cellars, to customers in Britain, $450 or so per six pack in the USA. As well as the above, the following also produce Folatières: the Domaine d'Auvenay in Saint-Romain, Jean-Michel Gaunoux and Château Genot-Boulanger, both in Meursault, and the Domaine Maroslavac-Léger in Puligny. The wine may also be carried by other merchants. Apart from Morgeot, a name which can be given to any premier cru vineyard downslope from the little road which connects Chassagne and Santenay, and to all the land immediately up-slope from Fairendes, close to the village, to Clos Pitois on the Santenay border - a surface area of 52 hectares - and apart from the mainly red wine vineyard of Clos Saint-Jean, Les Caillerets is Chassagne's largest premier cru. It is also widely recognised as the best. The climat, which includes the sub-divisions of En Cailleret, Chassagne, Vigne Derrière and Les Combards, covers 10.68 ha, and lies at an altitude of between 250 and 280 metres above sea level immediately to the south of the village itself. For some of the growers such as Guy Amiot and his son Thierry it is literally their back garden. As you might expect from the name Caillerets the soil is predominantly stony and shallow. Up at the top of the slope there are outcrops of bare rock. He we find mainly a white marl. This will give the wine weight. Lower down there is more surface soil and it is calcareous, producing a wine of steely elegance. A blend of the two, everyone says, makes the best wine. At best, and there is plenty of best, as the 16 or so owners include most of the 'first division' in the village, this is a Chassagne white - the transformation from Pinot to Chardonnay having taken place in the 1940s and 1950s, according to the late Albert Morey, who claimed to have been one of the pioneers in this respect - of real elegance, without the four-square character of a Morgeot, but with more weight and staying power than, say, an Embazées or a Romanée. Only (Grandes) Ruchottes can rival it. It requires a year or two more than most of the other first growths to come round, but then, as one might expect, it will hold up longer. The most successful vintages are not at their apogee until they are eight years old and still more than satisfactory at age 12 or even 15. The 2007 vintage, which was the subject of the tasing below, was an early harvest following a precocious spring, but then a generally mediocre summer. But the weather wasn't all that bad. There was some sun and heat, if intermittent, and not too much rain, even if it was largely grey. Unlike in many vintages the Pinots matured in advance of the Chardonnays. Those in Chassagne who did not start on their whites until the second week of September (September 10th was a Monday) were able to benefit from, finally, a change to dry, stable weather, and an evaporating north wind. This concentrated the flavours without reducing the acidity - which, before malo, was very high. The result was white wines of more definition and greater weight and depth than their red counterparts. It is difficult to generalize - which is best? - between the 2005, 2006 and 2007 whites. In each vintage there are some lovely wines, and they are now just about ready. The following tasting took place at the Restaurant-Hotel Montrachet in Puligny in January 2011. My grateful thanks to the growers for participating and to Thierry and his team for setting things up. I asked the growers to note their three favorites among the 13 wines on offer. Just about every wine received at last one vote (and far as I could make out, no one voted for their own wine). Marginally ahead of the rest was the wine of Marc Colin and his family. This, as you will see below, was one of my least favourites. De Gustibus! All wines, unless otherwise stated, are 'proprietaire' and produced by the lutte raisonnée. 55 ares. 18 to 20 percent new wood. Bottled after 16 months. Restained nose at fIrst. Ripe, cool, fresh and minerally as it evolved. Medium-full body. A little oak. Good acidity. Not the greatest finesse, but good weight and energy. Good plus. 56 ares. 15 percent new wood. Bottled after 11 months. Fresh colour. Youthful nose. A touch of oak. Flowery, minerally, balanced and attractive. Medium-full body. Long, positive and stylish. This has depth and finesse. Fine plus. 11 ares. 50 percent new wood. Bottled after 12 months. The colour is a little more evolved than most. On the nose this is full, rich, ample and quite oaky. A fullish quite powerful wine. Good grip nevertheless. Got better as it evolved but nevertheless a little clumsy. Another year in bottle won't do it any harm. 25 ares. 50 percent new wood. Bottled after 17/18 months. Flowery-herbal nose. Not a lot of oak. Some evolution. Perhaps a slight lack of energy. On the palate quite forward. Medium body. But very elegant. The fruit is most attractive. Harmonious and very good indeed, if not for the long term. 73 ares. One third new wood. Bottled after 15 months. I find something slightly scented on the nose, which puts me off. Some botrytis? Less so on the attck, but it comes back on the finish. Medium to medium-full body. Decent fruit and grip. Little evidence of oak. 56 ares. 30 percent new wood. Bottled after 12 months. Ripe, reasonably substantial, flowery, balanced nose. Good intensity and flair here. Fullish, ample and concentrated on the palate. Excellent grip. Lovely purity and harmony. Just the very slightest touch of oak. A yardstick example. 1.06 ha. Culture biologique. 30 percent new wood. Bottled after 18 months. Ample colour. A little evolution. But on the nose still a little reticent. Medium to medium-full body. Rich, concentrated, attractive and well-balanced. Good depth. Good class. Long and positive. Fine. Merchant wine. Latour buys the equivalent of 14 barrels (i.e. more or less the equivalent of one hectare). 50 percent new wood. Bottled after 16 months. Fresh, ripe nose with a touch of oak. Medium body. Balanced, attractive and à point. Good follow through, but essentially a delicate wine. It tails off a bit. Good plus. Magnum. 55 ares, en fermage from Madame Fernand Chauve since 1997. No new wood in this vintage. Light, flowery nose. No evidence of oak, but some evolution. Medium to medium-full body. The acidity in evidence. Reasonable length, but a touch clumsy. Better as it evolved but good plus at best. 19 ares., en fermage. Biodynamic from 2010. 20 percent new wood. Bottled after 15 months. Good substantial nose, with at first a touch of SO2, but this blew off. Fresh, plump, full bodied, rich and concentrated. Very good grip and lovely fruit. Real depth. Will still improve. Very fine. 20 ares. 25-30 percent new wood. Bottled after 15 months. Soft, fruity nose. Plump and attractive if without any real depth. Fully developed. Medium body. Decently positive and harmonious. Very slightly oaky. Long enough but a bit neutral at the end. Good plus. 35 ares. 45 percent new oak. Bottled after 11 months. Broad-flavoured nose with a touch of oak and some evolution. Fullish, rich and quite powerful. This will still improve. Indeed it got better and better in the glass. Very good plus. One of the group favorites. 49 ares. 20 percent new wood. Bottled after 16-18 months. At first the nose was a bit neutral and four square, but it opened up and brightened up on aeration. Medium to medium-full body. Good grip. Only very slightly oaky. Good energy. Will improve. Very good plus. Another group favorite. Ramonet (35 ares in two parcels) and Jean Chartron of Puligny (30 ares). In addition Vincent Girardin owns just under one hectare which he bought from the Domaine Duperrier Adam in 2008. 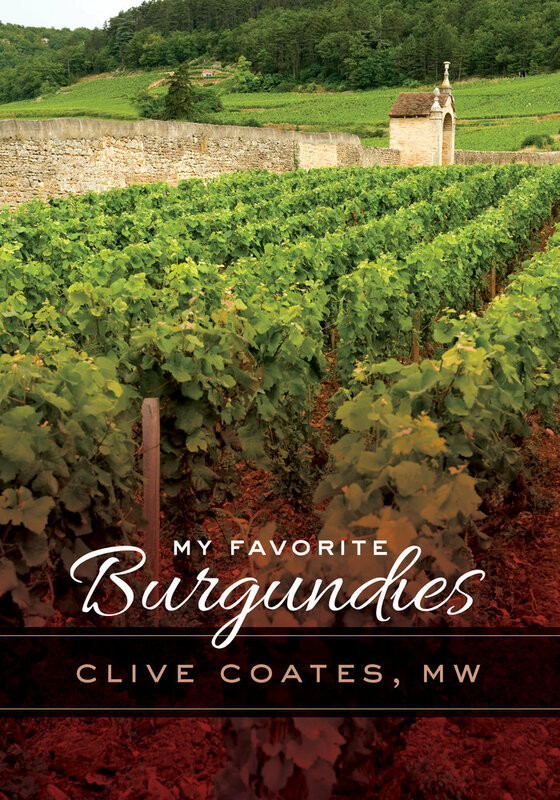 In this book, Clive Coates, a Master of Wine who has spent four decades of his distinguished career in Burgundy, shares his vast insider’s knowledge of one of the world’s most exciting, complex, and intractable wine regions. 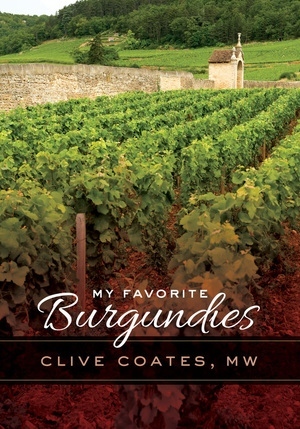 Personal rather than encyclopedic, and informed by Coates’s unparalleled access to regular, extensive tastings, this book imparts the author’s philosophy and expertise as to how best approach, appreciate, and discuss the wines of Burgundy. Coates updates and supplements the domaine profiles featured in his two previous books, Côte D’Or and The Wines of Burgundy with new in-depth assessments of specific vineyards. Divided into three sections—Vineyard Profiles, Domaine Profiles, and Vintage Assessments—My Favorite Burgundies considers the leading vineyards and today’s top estates, and features detailed maps and a wealth of tasting notes that reflect how the wine develops as it ages. Enlivened by Coates’s singular, firsthand knowledge and precise descriptions, this is an indispensable guide for amateur and professional enophiles alike. Clive Coates, MW (Master of Wine), is a renowned wine writer. His fine wine magazine, The Vine, was published from 1984 to 2005. His books include An Encyclopedia of the Wines and Domaines of France, The Wines of Burgundy, and The Wines of Bordeaux (all from UC Press). So You Think Today's Burgundies are Brilliant? What Are Winemakers Doing About Global Warming?